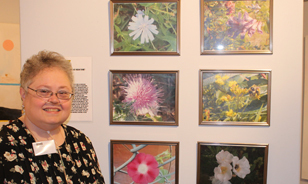 On October 24, Goodwill of the Southern Alleghenies (Johnstown, PA) joined forces with the Bottle Works Ethnic Arts Center to host The Art of Recovery, an art exhibit celebrating the journey to mental health and wellness. More than 80 guests attended the event, including practitioners, family members, participants and community members. The idea was born during a creative coping group art class at the Johnstown Goodwill’s Recovery and Community Integration Program. The class offered a variety of activities as outlets to coping with stress. One particular activity involved participants using several donated windows as canvases for their own stained glass window creations. Inspired by the participants’ artwork, the agency’s staff contacted the Bottle Works to assist with organizing an exhibit that would showcase their students’ talents to the community. Each piece of artwork was displayed with an accompanying biography of the artists describing the role that art has played in their recovery from mental illness and in building skills in living, learning, working and community involvement. Pieces on display included a crocheted blanket, painted windows, photography, professional pen and ink pieces, jewelry and decorative beadwork. Artists were in attendance to speak with the guests about their work. The participants also had the opportunity to sell their pieces, thus giving them an opportunity to support their financial goals. The featured speaker for the event, Rhonda Szarka, shared her journey through recovery from being a resident in a state mental hospital to working with the Johnstown Goodwill as a mental health peer specialist. “Through our art, we have tried to express how we see our world and our place in it. All of us are on a journey of recovery and each of us is moving at his or her own pace and ability. Art provides us with relaxation to relieve the stressors in our lives,” said Szarka in her address to the attendees. As a result of the positive impact that The Art of Recovery had on both participants and guests, planning for the next event is already underway. The goal is to make the art show an annual event.